While a 0.25% interest rate rise is expected on Thursday, it is not clear if it could be a short, sharp shock, or a sign of things to come. Here is a breakdown of the proposed new rules for buy-to-let mortgage lending by the Bank of England's regulation arm. One in four mortgage holders fear they will be in financial trouble when interest rates start to rise, research has found. Some 27% of those surveyed for the Building Societies Association (BSA) and charity the Money Advice Trust think they will be in difficulty when the base rate eventually moves off its historic 0.5% low. One in 14 (7%) people said that they would be in serious financial trouble if mortgage rates and repayments changed as they expect over the next three years, while a further one in five (20%) said this would cause them slight financial problems. Around 39% of those surveyed said they will be forced to cut spending on holidays and eating out to cope with rate rises, while one-fifth plan to reduce spending on essentials such as clothing and food. The Chancellor George Osborne has tonight set out "radical" planning reforms designed to help build up to 200,000 new homes. The controversial proposals, announced during his annual Mansion House speech, would see councils forced to pre-approve brownfield sites for housing developments. Mr Osborne also said it was important that the Bank of England was able to act "independently of politics" and take action by itself with new legal powers, to help fix Britain's housing market. These were expected to be in put place by the end of next May. "I want to make sure that the Bank of England has all the weapons it needs to guard against risks in the housing market," the Chancellor said. George Osborne is still failing to tackle the root cause of the housing crisis which is that we are not building enough homes to match rising demand. Over the last few years Labour has repeatedly called for action on housing supply, but the Chancellor has failed to act. Under this government housebuilding has reached the lowest peacetime levels since the 1920s. You can't deal with the cost-of-living crisis and create a strong and balanced recovery without building more homes. I am acting against future risks in the housing market by today giving the Bank of England new powers to intervene and control the size of mortgages. George Osborne has said he is to give the Bank of England legal powers to stop people taking out mortgages too large for them to pay off. In his annual Mansion House speech, the Chancellor is to set out how the Bank will be able to order restrictions on the ratio of mortgage loans compared to borrowers' incomes, or to the value of their house. 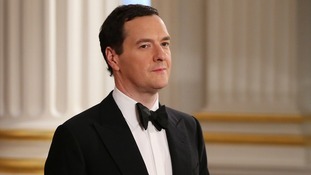 In his speech, Mr Osborne is expected to say that while the housing market does not pose an immediate threat, it is important to insure against risks in the future. UKAR, the Treasury-owned company set up to wind down the mortgage books of failed lenders Northern Rock and Bradford & Bingley, says the Government should get back £38.8 billion it is still owed. The company has already repaid £10.4 billion since 2010, including £5.1 billion in the 15 months up to March 31st of this year. Announcing the positive results, UKAR said: "A lot of good work has been achieved to date and we expect to repay the remaining £38.3 billion debt in full." The company said rising housing prices coupled with low interest rates had been "good news for out customers". Families are paying more on average for part-time childcare than they spend on their mortgages, according to a new report. It reveals parents are handing over more than £7,500 a year for childcare for two children, around 4.7% more than the average mortgage bill. It found that a family with one two-year-old child attending nursery part-time (25 hours a week) and a five-year-old in an after-school club will pay out £7,549 a year on average. This is higher than the UK average annual UK mortgage, which the report says is £7,207 according to official data.